Although your teeth are important for chewing and speaking, they also serve another important purpose. They play a valuable role in your confidence. If you do not like their appearance, you may find yourself holding back in social settings or covering your mouth when smiling because you are insecure about how they look. 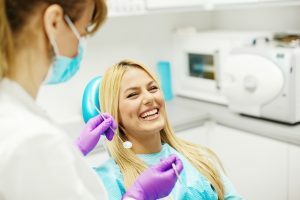 Did you know that you can get the smile that you have always wanted with your cosmetic dentist in Washington D.C.? Using customized procedures, they will transform the appearance of your teeth and your self-esteem with a smile makeover. By resolving tooth discoloration and staining, your smile will look younger and brighter. Using a highly-concentrated whitening agent, your enamel will be deeply penetrated to get it several shades whiter. Your results will last with the right aftercare, like maintaining your oral hygiene. Veneers are versatile, allowing them to be used to hide several flaws. By placing the thin shells on the front surfaces of your teeth, they instantly become whiter, shapelier, and more proportionate. This is the perfect option if you suffer from discoloration, chips, cracks, or minor alignment issues. Dental bonding is a simple and noninvasive way to resolve chips, cracks, discoloration, and several other concerns. A resin material is applied to your teeth and sculpted to improve their appearance. It is customized to match your enamel color for natural-looking results. Although dental crowns are often used in restorative dentistry, they can also be used for cosmetic purposes as well. If you have a tooth that is damaged, severely discolored, or has an abnormal shape, placing the protective cap over it will improve its appearance. Now, crowns are made from all-ceramic material to look like a natural tooth. Now, you can replace your missing teeth with the next best thing to your own. Dental implants closely look and function naturally while also offering the potential to last for a lifetime. With over a 95% 10-year success rate, you will make a true investment in your oral health and quality of life. If you are tired of hiding behind imperfect teeth, get the smile of your dreams with your cosmetic dentist today! Dr. Yelena Obholz provides individualized treatment plans to create healthy, beautiful smiles. In addition to general dentistry, she is continuing her education at the Las Vegas Institute for Advanced Dental Studies to offer her patients the highest level of care. If you feel insecure about your teeth, she has the solutions you need to restore your confidence. Contact our office today to schedule your consultation for a smile makeover.